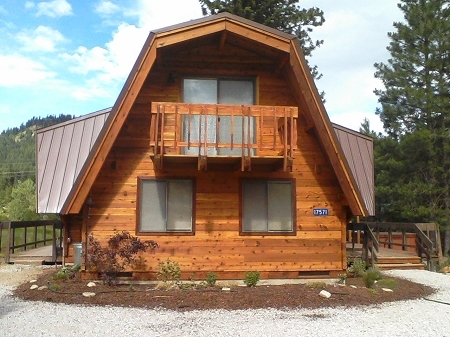 How to Finish Your New Log Home: Timing is everything! 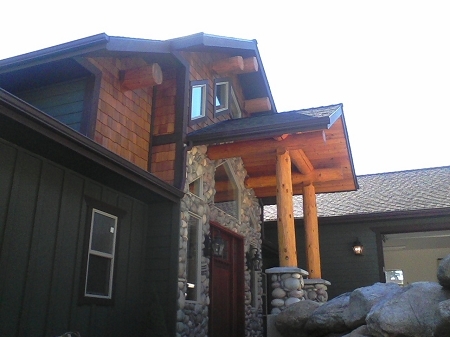 Our most asked question is "when do I apply my interior and exterior finishes to my new log home? This seems like a simple thing, but you would be amazed at how many people spend way too much money and complicate the situation by not applying their finishes at the right time. MM Wood Restoration & Protection has this to say about new log home finishing, "some people pay up to twice as much as others due to their timing of the finishes!" What? How can this be? 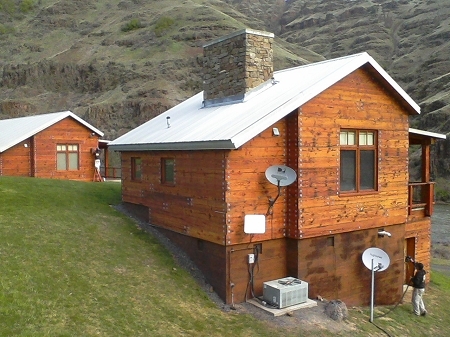 Here is MM's plan for finishing new log homes. 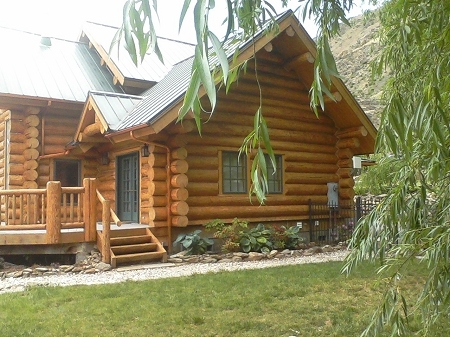 When you are planning your log home, you need to think of not only the mechanical issues, but also the timing of the finishing to get a higher quality finish for the least amount of cost. WE like to come into the project right after the building is dried in (roof system on) before windows, electrical, framing, ect.. We perform a twin chemical wash using Lovitt's Cleaner & Brightener on the inside and outside logs. First, we apply the wood cleaner to the interior and exterior logs and lightly power wash the logs with very low pressure, high water volume to remove the dirt, spores, boot marks, discolorations, and dirt from the logs so we have clean, PH balanced, and open wood grain in the logs ready to accept finish. Then we would mask off the LRO's (Rough Log Openings) for doors and windows to prevent exterior stain from entering the inside and keep interior finish from exiting to the outside. We like to prep and finish the exterior logs first, usually a light hand sand to knock off any fuzz (fracturing) or splintering from the surface of the logs. 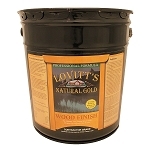 We then apply 2 coats of Lovitt's Emerald Gold Log Home Stain to the logs, back brushing both coats into the wood to saturation (the wood will not accept any more finish). We then move inside and begin preparing the interior logs. We start by lightly sanding the interior using 80 grit orbital sanders to smooth the log and sand out any imperfections. 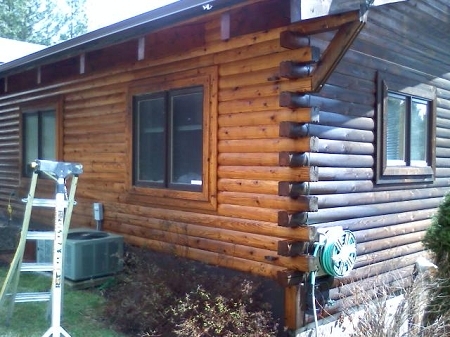 We then apply the first coat of Lovitt's Platinum Clear Interior Log Home Finish using a 4:15 spray tip. Once the first coat dries, usually about an hour, we come over the logs with a fine sanding sponge (400 grit) to knock down any roughness on the first coat of finish. We then clean and vacuum the interior logs and floor to prepare for the second coat (top coat). The second coat is applied the same way and the interior logs are done. During the construction process you may experience nicks, scrapes or other damage to the interior finish, but with Lovitt's Platinum you can touch up and repair any areas easily. If you notice, there was minimal masking and protection, there is nothing in the house to damage with water during the cleaning process, and the process can be completed in less time. If you wait, and try to finish your interior after the windows are in, the electrical is installed, ect. you will have a higher price tag for the interior finishing. This is due to having to protect installed items, additional masking, and the contractor now has the possibility of damage, which raises the risk factor for the contractor and therefore the price. If you need help during this process, contact us a Lovitt's Coatings or contact MM Wood Restoration & Protection (www.woodspecialist.com) and they will be happy to assist you through the process with technical advice and or contracting services.